We’re told over and over that you can be successful with just a few hours a week. Recruiters promote the idea that you can make it to sales director if you work 10 to 20 hours per week for one month. 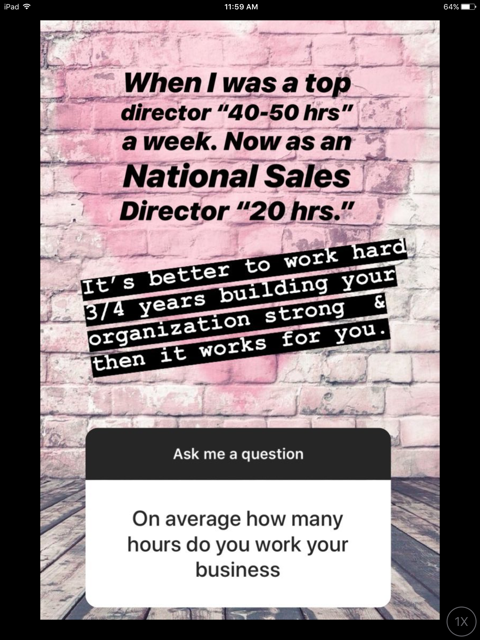 Or you may be told that working 9.5 hours per week for six months or less will get you to sales director. Truthful sales directors will tell you that they easily work 50 hours a week or more, just to maintain a small unit. They’re struggling to make minimum production each month, and it takes a lot of time to stay afloat. Those with larger units and bigger production are spending just as much time, because they have to do a lot of recruiting and inventory frontloading to get their production. That takes lots of time too. I love how she puts the hours in quotes. Quotes are used to either quote someone or to express sarcasm or irony. Do you think this former school teacher meant to be sarcastic or ironic in giving the number of hours? I suspect Dacia worked more than 40 to 50 hours a week as a director. 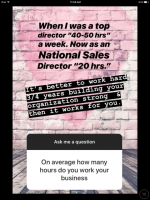 And she works more than 20 hours as an NSD… although if you are lucky enough to get a large pyramid underneath you and you can use your “celebrity status” (see what I did there?) to help sell the dream, you can get a lot of mileage out of the people underneath you and work less than you otherwise would have to at that level. Straight from the horse’s mouth! No one admits to the time they spend on the phone, online, or doing other “non-IPAs”. Things like that are necessary. Sure, Dacia might spend 20 hours a week as an NSD, but that’s also AS AN NSD who doesn’t have maintenance requirements for her cars or trips. And she also has an assistant, which takes more money out of her bottom line income. I remember when I got my first commission check as a sales director and my senior director asked me if I was excited about it? I turned and looked at her and I said that’s it? that’s all I get for all that hard work? it doesn’t seem worth it and you should’ve seen the look on her face!!!!! I look at DIQs and their checks listed in newsletters. It’s pitiful. All they have to know is to double what their check is to estimate how much their Director commission will be, and they’ll see it’s not much. AT ALL. Anand then they have to pay for that horrific mauve Director suit, meeting space, postage, newsletters, a unit website, prizes, DIT Week travel, Leadership Conference, and more, more, more. I’ve never worked harder than as a Director. So glad to be out of that hamster wheel! Hey! What happened to that sign-up lure that you could easily make an extra $500 or $1,000 a month immediately working part time? How did we flip-flop from rolling in easy money from the first day to “work hard for 3 to 4 years” before seeing results? No one can score if they keep moving the goal posts. That easy money must be a mirage. Does taking your family to Seminar count as part of that 20 hour work week or is that considered quality vacation time? Just curious. Seminar is celebration time. It’s not part of the work week at all. Nobody in Mary Kay takes vacations. You can’t afford to “neglect your business” that long or you’ll lose your Pink focus… and your unit. What everyone else imagines is a vacation is to a Mary Kay lady just a change of scenery where she can try to sell to and recruit women who haven’t already told her NO. Funerals, weddings and hospitalizations all fit into the same category with vacations. Don’t forget volunteering. Shelters and food banks are a great place to find new faces. Nursing homes at Christmas and Valentine’s Day. That’s my Director’s forte. I got one. Dance recitals. Lots of moms ripe for the picking during the long practices right before the shows. The ones you don’t see at the normal weekly classes.